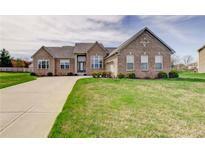 Below you can view all the homes for sale in the Cobblestone subdivision located in Greenwood Indiana. Listings in Cobblestone are updated daily from data we receive from the Indianapolis multiple listing service. To learn more about any of these homes or to receive custom notifications when a new property is listed for sale in Cobblestone, give us a call at 317-308-8198. Special features: 3 car finished garage, walk-in closets all 4 bedrooms, double sinks, stainless steel appliances, granite, glass french doors in den, crown molding, flip-of-the-switch gas fireplace, loads of windows for natural light, mud room with built-ins, open deck on main, laundry on upper level, FULL basement w/multiple egress windows. Award winning schools. GREAT HOME! MLS#21635985. Carpenter, REALTORS®. Beautiful pond view from rear wood deck. MLS#21632736. Roger Webb Real Estate, Inc.
MLS#21632479. Keller Williams Indy Metro S.
Nearly 1/2 acre lot too! THIS IS IT! MLS#21627161. Smart Choice Realtors, LLC.